With the changing of the seasons comes a change in the anime guard. Out with the old shows, in with the new ones and with them comes a new crop of openings and endings. Unfortunately this time around the resulting harvest is rather small, but only in quantity, not quality. For you see, one of the key pillars of my seasonal opening and ending favorites article is they have to actually be attached to a show I am watching. 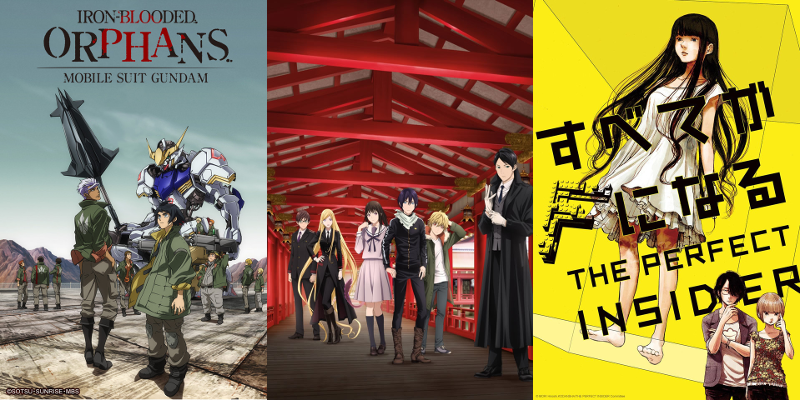 And since I am not watching many of the shows that have from what I have heard to be good openings and endings, such as Lupin III (because it isn’t legally available anywhere I know) or The Asterisk War (because I am just thoroughly through with magical high school shows), I am left with a rather small number of openings and endings from this season I actually truly like, at least enough to put on a top favorites list. As a result I don’t have enough to field a full Top 10 list, especially since I am sticking to the one entry per show direction I started on in the Summer (I basically don’t want to regress to what I did in the Spring just one season after implimenting a decision to prevent such a repeat), so you’ll have to make due with with a Top 5 list (plus honorable mentions). For several weeks I was contemplating whether I would even do top favorites OP/ED article for this season, given the small number, and just roll them into my end of the year overall favorites openings and endings article and just get that one out a few weeks earlier, but in the end I decided to complete the seasonal coverage for the year. This is simply just a beautiful opening that highlights the beauty that Beautiful Bones is capable of. I also love the use of surrealism, showing some scenes from different angles to make us wonder what is really going on. I like the alternate take this ending gives to Seraph’s main characters, showing them in normal situations, which is nice to see considering their lives are anything but “normal”. I also really like the part of the song that is being sung in a language that’s not Japanese. I’m not entirely sure what it is, I think it might be Greek, but whatever it is it is great. Damn shame Seraph’s second opening is rather lame though. How the hell does one make a fripSide song that just feels devoid of energy? I know, it’s GARO so that would mean JAM Project would be the obvious choice for its representative, except not this time. While GARO: Crimson Moon’s OP is still pretty good, the odd thing is it would have been perfect for the first GARO anime, as it has a clear Spanish influence in its music. The song may be good, but it ultimately ends up clashing with the show it is attached to, as GARO: Crimson Moon is based on the Heian period of Japan, so Spanish guitars have no place here. It helps that Crimson Moon’s ending a pretty damn good, too. I also love how the ending focuses on Inari, the trio of doll-like women wearing fox-themed attire that serve as Crimson Moon’s Watchdog. Seeing them in motion is beautiful, and it is a treat just to see them move at all, as they’ve been perfectly stationary in the show itself so far. I bet you thought we were going to raise our flags with MAN WITH A MISSION when you saw Iron-Blooded Orphans as part of the header image. Well tough luck! We’re gonna sing about orphan tears (wait, what?)! Seriously though, I love the OP for this show, I really do. But I love the James Bond-style ending a hell of a lot more. I love how many of the episodes end with the music building into the ending (something I also loved when they did that in Silver Spoon Season 2), and then suddenly “Orrrrr-phans!”. Just glorious. I didn’t like this OP at first. I really just did not. It felt odd, disjointed, and overall just lacking, especially when compared to the great opening from the first season. Now, I still think it is weaker than the first opening, but I definitely have come around on this one the more I saw it. I love that it still has the gorgeous visual style from the first opening. How often do we see stylistic synergy between multiple OPs and EDs for a show? And it is still a style that I maintain that I want to see an entire show use, because it is just beautiful. Part of the reason I was a little less forgiving for GARO: Crimson Moon’s opening is because JAM Project just so happened to do another, far greater opening this season. Now I love the quirky music of One Punch Man’s ending, and could write a decent length on its visuals, but while I do love the ending, nothing is topping the opening for me. It is so epic and full of energy that I just can’t help but get caught up in it. This is easily my favorite opening or ending of the season and one of my favorites of the entire year. This was the very first opening or ending of this season I saw. I actually saw it before I started watching the show because it was released on places like YouTube before the show started airing. If you know anything about my tastes in OPs and EDs, you know I love when something has some stylistic flair to it, and The Perfect Insider’s opening has that. I don’t really think I’ve seen anything like it, when it comes to anime at least. And it doesn’t hurt that the song is pretty damn good too. If it wasn’t for the epic hype train that is One Punch Man’s opening, this would be my favorite of the season.